My creative pregnancy photography captures this special time in your life which will make you feel beautiful and excited. Pregnancy is a momentous part of your life narrative and yet it is so fleeting; in just nine months, you go from growing new life inside you to giving birth to a completely new human being. Few physical experiences are as raw, profound, and moving as maternity, and I’m here to help you visually document this momentous occasion. I am experienced in maternity photography and have worked with many Perth mums-to-be both in the studio and on location to capture the unique ways that they experience pregnancy. I’ll be able to work with you to develop a concept and create beautiful images that you will be able to look over fondly for many years to come. Prior to the day, I’ll work with you to develop a shoot concept that best suits your style and tastes. Whether you want to explore the metaphor of new life in a natural setting on the beach, in the park, or even in your garden at home, or if you want to focus on the sculptural shape of your beautiful bump in a minimal studio setting using natural fabrics to accentuate your curves, I’ll work with you to plan out your ideal shoot. The day itself will be relaxed and peaceful. When we meet up, I’ll work to ensure you feel beautiful and completely at ease so that when I start taking the photographs, your expressions and poses are as natural and relaxed as possible. Pregnancy photography takes around one hour, but we can take all the time you need to capture that perfect image. I have a wide variety of maternity gowns to choose from. In fact, most of the examples on this website show dresses that belong to KS PHOTOGRAPHY. My mums-to-be are more than welcome to choose up a couple of different dresses for their session. Prior to the shoot, I will contact you personally to discuss your preference in style, colour and accessories. 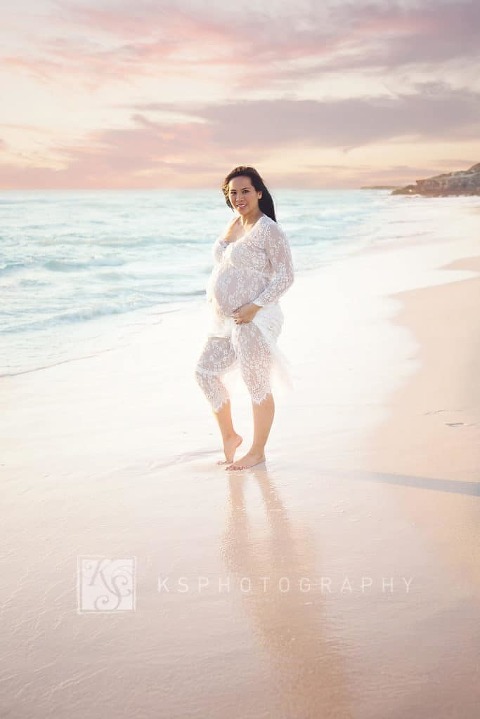 To enquire about a maternity photoshoot with KS Photography, at my Iluka, Joondalup studio or on location in one of Perth’s beautiful beaches or parks, please don’t hesitate to get in touch with me by using the online contact form. For pricing information on maternity photography please click here. As a family focused photographer, I also offer a number of other services, including family, child, baby, and newborn photography designed to capture your unique story.